"Do you learn best by example and experimentation? This book is ideal. Have your favorite editor and compiler ready-you'll encounter example code you'll want to try right away. 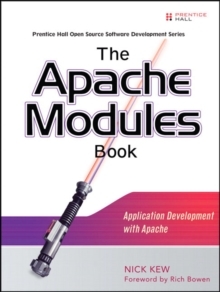 You've picked the right book-this is sure to become the de facto standard guide to writing Apache modules. "-Rich Bowen, coauthor, Apache Administrators Handbook, Apache Cookbook, and The Definitive Guide to Apache mod_rewrite"A first-rate guide to getting the most out of Apache as a modular application platform-sure to become a must-read for any Apache programmer, from beginner to experienced professional. It builds up carefully and meticulously from the absolute basics, while including chapters on everything from the popular Apache DBD Framework to best practices, security, and debugging. "-Noirin Plunkett, documentation committer to the Apache httpd project, and member of the ASF conference committeeThe Only Comprehensive Guide to Developing Apache 2.x Modules and ApplicationsApache is more than the world's most popular Web server-it's also an extraordinarily powerful and extensible development platform. Now, ApacheTutor.org's Nick Kew has written The Apache Modules Book, the first start-to-finish, example-rich guide for every developer who wants to make the most of Apache. Kew begins with detailed, accessible introductions to Apache's architecture and API, then illuminates all the techniques you'll need, from request processing through code security. He brings together the best of both worlds: powerful C-based techniques for accomplishing tasks Perl or PHP can't handle, implemented with tools that deliver all the productivity you'd expect from higher-level languages. Utilizing realistic code samples, Kew introduces techniques documented in no other book-and, often, nowhere else at all. Coverage includesUsing Apache Portable Runtime (APR) to streamline C development and avoid its pitfallsLeveraging Apache DBD to build applications far more scalable than classic LAMP softwareWorking with the latest Apache 2.x features: filter modules, XML support, and smart proxiesMastering best practices, from thread safety to multi-platform developmentUtilizing the Apache Authentication FrameworkTracing and debugging problems in both Apache and your custom modulesForeword Preface Acknowledgments About the Author Chapter 1 Applications Development with Apache Chapter 2 The Apache Platform and Architecture Chapter 3 The Apache Portable Runtime Chapter 4 Programming Techniques and Caveats Chapter 5 Writing a Content Generator Chapter 6 Request Processing Cycle and Metadata Handlers Chapter 7 AAA: Access, Authentication, and Authorization Chapter 8 Filter Modules Chapter 9 Configuration for Modules Chapter 10 Extending the API Chapter 11 The Apache Database Framework Chapter 12 Module Debugging Appendix A Apache License Appendix B Contributor License Agreements Appendix C Hypertext Transfer Protocol: HTTP/1.1 Index About the Web SiteApacheTutor.org contains code examples from the book, all designed for easy use and integration into existing applications.